"Barbecue shrimp, one of the four or five best dishes in all of New Orleans cooking, is completely misnamed. 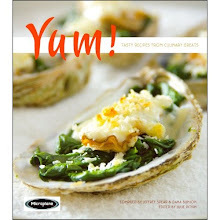 They're neither grilled nor smoked, and there's no barbecue sauce"...Tom Fitzmorris author of NEW ORLEANS FOOD. Fitzmorris suggests using large heads-on shrimp, since the fat in the shrimp heads makes most of the flavor. Resist the urge to add lots of herbs or garlic. Rinse the shrimp and shake the excess water from them. Put them in a large skillet (or two) over medium heat, and pour the lemon juice, wine, Worcestershire, and garlic over it. Bring the pan to a light boil and cook, agitating the dish, until the shrimp turn pink. Cover the shrimp with a thin but complete layer of black pepper. You must be bold with this. Trust me, it is almost impossible to use too much pepper in this dish. Continue to cook another couple of minutes, then sprinkle the paprika and salt over the pan. Lower the heat to the minimum. Cut the butter into tablespoon-size pieces, and add three at a time to the pan, agitating the pan as the butter melts over the shrimp. When one batch is completely melted, add another until all the butter is used. Keep agitating the pan to make a creamy-looking, orange-hued sauce. When all the butter is incorporated, serve the shrimp with lots of the sauce in bowls. Serve the hot French bread for dipping. Also plenty of napkins and perhaps bibs.